barrongreenteam.com: 8 Head Ductless Multi-Zone System with Branch Boxes a.k.a. "The Super Multi"
8 Head Ductless Multi-Zone System with Branch Boxes a.k.a. "The Super Multi"
I know, I know, it seems that I am mind blown with everything, but mostly that is because I only post stuff that gets me excited. Below this post is the Daikin ENVi thermostat (mind explosion), but in this post is expanded detail about the new Daikin RMXS Super Multi (coma inducing). 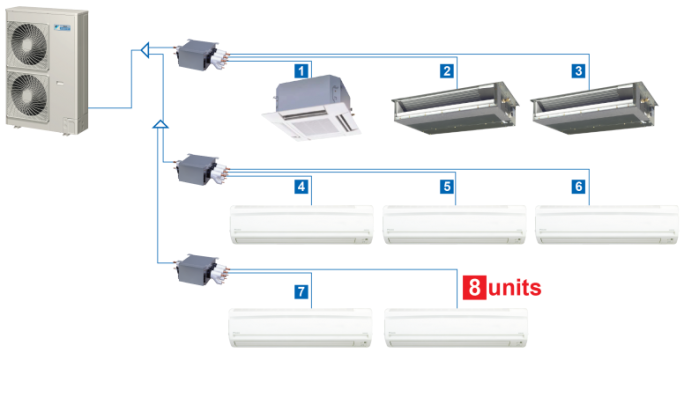 A lot of the basics of "branch box" systems are the same, as I described in a recent article The 8 Ductless System Types..
"This is where things start to get a little different so pay close attention. When you go to my pictures, etc. and look at ductless; do you see how each head has a line that runs from it all the way back to the heat pump? This is how the standard multi zone systems work, if you have 4 heads you have 4 lines. Now, with a branch box system 2 of those run into 1 and the other 2 run into 1 (this is called a branch), then you have a Y and only one line that has to run all the way back to the Heat Pump (HP) outside. This is one difference about the Super Multi. The other is that the HP is a larger 4 Ton and will allow you to, say, have just 2 large 24k heads on it or all the way up to 8 smaller heads." The one thing that makes ductless systems so popular is the flexibility and ease of installation. Super Multis take that flexibility and multiply it, well...by 8. Not having to run all the lines from the indoor heads back to the heat pump, but instead, to the intersections (branch boxes pictured below) lets you spend less money on materials and more on getting a kick@$$ heat pump like the RMXS (pardon my language there). Excellent information. Easy to install and flexibility that all I need. The most problem with other products is that they are not easy to install they come with long instruction that explains how to install them but they are not.